For centuries, tile has been used to enhance and improve different floors, walls, and other surfaces within people’s homes. To this day, it still remains a favorite floor option among homeowners because of its style, durability, and benefits.If you are in the market for new tile flooring in Rancho Cucamonga, CA, look to our local floor store and showroom. We assist homeowners with the entire floor replacement process. From start to finish, our knowledgeable professionals ensure that your home is equipped with beautiful tile that satisfies your expectations in look, longevity, and price. Our inventory boasts a large collection of different floor tiles. Ranging in shape, size, material, texture, finish, and color, there’s no end to the design possibilities when you shop with us. The following are just some of the different types of tile carried at our location. With so many different types of tile flooring available, you may wonder how you’ll ever find the perfect product for your home. Fortunately, our sales associates know the benefits of each type of material, and are happy to help you narrow down the selection until you find the tiles that best suit your needs and personal style. 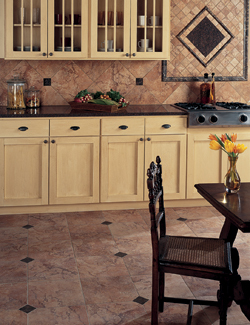 Are you trying to determine if tile is best solution for your floors? Tile floors provide a number of practical benefits, including durability, easy maintenance, longevity and versatility. Time and time again, floors made with ceramic and porcelain tile have proven resistant to the most common types of wear in high traffic areas, such as water damage, staining, scratching, denting, and fading. Even if they are damaged over the years, fixing cracks or other blemishes is easy. You can simply replace the broken tile without affecting any surrounding tiles. As far as daily maintenance is concerned, all you typically need to do is sweep and mop to keep your floors looking beautiful and fresh. When cared for properly, tile flooring has the ability to look great for years into the future. The only thing you may have to do to maintain its appearance and performance is invest in resealing every few years. Available in a range of shapes, sizes, colors, and finishes, tile is a great compliment for any interior home design or décor. Whether you want something classic or modern, you are sure to find the ideal style in tile for your space. One of the best benefits is that you can customize the pattern of your tiles any way you want. Whether you like the classic look of plain white porcelain tile throughout the house, or you want different hues of slate tile for something truly unique, our team is here to help you turn your flooring dreams into a reality. To help aid in your shopping experience, each of our tile flooring products is placed on a 5-Star rating system. This system allows you to quickly determine the relative performance and durability of the products. To ensure you are completely satisfied with your purchase, we offer our Confidence Plus Warranty on all 4-Star and 5-Star flooring materials. This warranty allows you 30 days to decide if you are satisfied with your new floors. If you aren’t, we’ll replace it without charging any labor costs. When you have made your final purchase decision, we make sure the durability and beauty of your floors are optimized. We go above and beyond to provide exceptional customer service throughout every aspect of your flooring replacement. Our staff includes experienced technicians that deliver professional tile flooring installation within the home. With years of experience under their belts, our installers know the most effective ways to perform your installation. They take the time to ensure the subfloor is level so the tiles lay flat. They also work with precision so each grout line is straight. It would be a shame to buy beautiful new slate, porcelain, or ceramic tile only to have it installed improperly. At our flooring store, we know that the quality of the installation service is just as important as the materials you purchase. We understand what a significant investment new floors are. That’s why we work to maximize the results. By working with our professionals and taking care of your tile flooring, you can expect to have gorgeous floors for years to come. In addition, every installation we perform is backed by a Lifetime Installation Guarantee. This is our promise that if you ever experience an installation-related problem with your new tile flooring, we’ll make it right at no cost to you. We're proud to serve customers throughout San Bernardino, CA, including the cities of Rancho Cucamonga, Alta Loma, Upland, Fontana and Ontario, California.